Breezy’s in Cedarhurst has the most beautiful, chic, and necessary items for gifts, for a Passover treat to yourself, or for any time of year. Check out her gift items on facebook. She has the trendiest and most beautiful seasonal items too plus a FULL line of cake decorating supplies, from adorable cupcake wrappers, toppers, molds, piping tools and more to edible toppings that are so hard to find. I’m currently obsessed with the paper goods in so many colors and designs that I cannot find anywhere else, and the French serving pieces that make great gifts and come in a zillion colors. 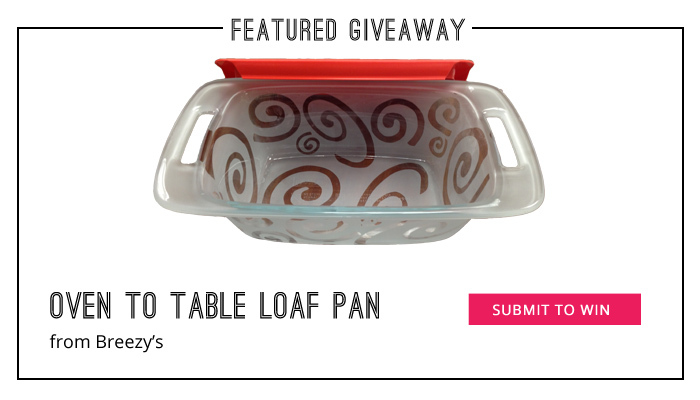 Breezy’s is giving a lucky winner this stylish, OVEN to TABLE, loaf size pan, with cover. The etching is gorgeous. It’s a great size and color. Submit to win. So cute! I can always use another dish for Pesach and would love to win! What a beautiful pan! Would love to have one! You find the greatest items for Giveaways – keep it up. I would like to add this pan to my collection! I LOVE Gourmet Kosher Cooking! I look forward to your email with recipe ideas and products. i’m especially looking forward to trying some of your Passover Recipes! The pan looks great and I would love to win it. STUNNING piece. I’d love to win it !! Looking forward to adding new dishes for Passover this year. Beautiful! I’d love to have that on my table. The loaf pan is gorgeous and would surely make a beautiful addition to the seder table! What a beautiful and unique design. I think it would look great filled with one of the colorful vegetable sidedishes featured here for Passover. What a great frosted looking dish. Would go with anything. Thank you for giving us the opportunity. I would hope that anything I bake in this loaf pan would come out as beautiful as the pan! Really like the pattern. would love to see a matching trivet as it can be used for a beautiful table service. Thank you for the giveaway.I love the design. Your staff always finds the best things to make our Yom Tovim even more special! Always looking for nice baking dishes. Would love to win! What a pretty dish! This would complement any style you bring to the table! Great dish! It is very kind to offer a giveaway. Thank you. LOVE LOVE THIS PAN! I CAN THINK OF SO MANY WAYS TO COOK AND SERVE WITH IT! I use lots of oven to table on my shabbos and yom tov table. I would love to win this beautiful oven to table. This dish is beautiful. I can imagine several items I could make and serve it. Thanks for all of the great recipes! I often like to bring something homemade as a hostess gift along with a plate or pan that the hostess can reuse. This fits the bill perfectly. Would love to win this dish. Chag Kosher V’Sameach! What a great pan to cook and serve in! I already subscribe and I tweeted about this! I love that this loaf pan has a lid. If there is any leftovers after my yummy meal this pan would be great.